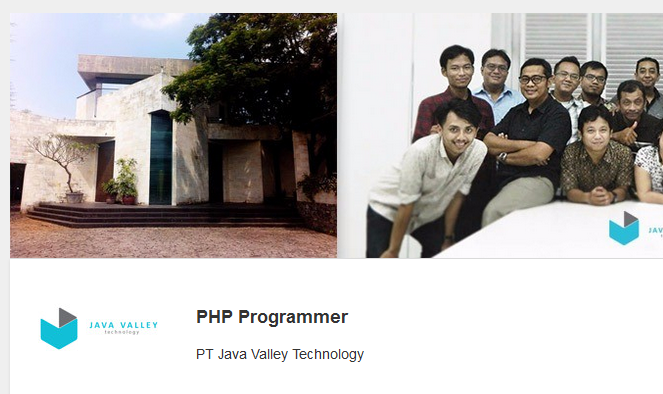 Loker123.com - Lowongan Kerja PHP Programmer PT Java Valley Technology Semarang Jawa Tengah Bulan November 2015. Java Valley is a company engaged in Information Technology. Though we're the new kid on the block, but our senior staffs has 10+ years' experience in Software Development and/or IT Infrastructure. We provide services for our local and International clients from our little HQ in Semarang, Central Java, Indonesia. We're inviting young professionals to join our team. PHP Programmer berhubungan dengan website, dan siap menerima target. PT Java Valley Technology Semarang.